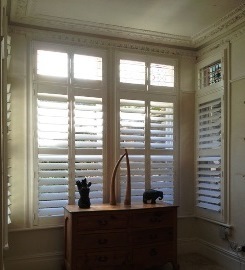 These shutters, were installed to a holiday apartment in St Ives, Cornwall. 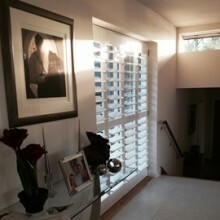 The client was anxious to provide a good degree of blackout from the adjacent street lights at night, whilst also providing a stylish solution and sound insulation from noisy revelers passing by at night… the apartment is right next to a busy pavement. Sleek, glossy, glamorous and a total triumph… we love them! 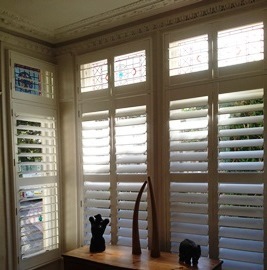 The beauty of using Plantation shutters in bay windows is that they bring a really streamlined look to a room, which unlike heavy curtains also allow for maximum control of light at all times of day and evening. 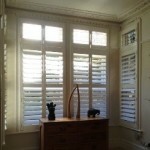 Once in a while, we come across a shutter project that really stands out from the conventional and this is a great case in point. This stunning building has a former industrial pedigree and has now been imaginatively converted into a series of apartments situated on the waterfront in Bristol, in a burgeoning area of development. 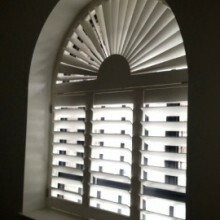 The defining exterior characteristic of the building are the magnificent arched window openings, which are perfect for the installation of shutters. 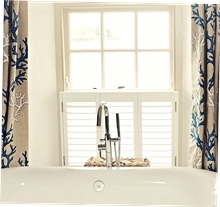 From within, they deliver amazing style, fantastic privacy and great light control… perfect for modern living! 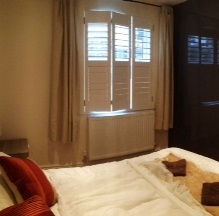 Bedroom and bathroom shutters , at the newly refurbished hot spot in St Mawes… The Idle Rocks Hotel. The client wanted the shutters to complement the curtains and opted for ‘Cafe Style’ …for a cool style statement and to prevent passing people on boats from peering in! We love them AND it shows nicely that shutters and curtains can work well together.